Step 1 Cut the cod into large pieces and place in a saucepan. Cut the potatoes into half-inch dice and add to the salt pan. Cover with water, add the bay leaves and bring to a simmer. Cook at a slow simmer until the cod flakes easily and the potatoes are soft enough to be crushed between your fingers, 25 to 30 minutes. Step 2 Meanwhile, smash the garlic into a puree using either a mortar and pestle, the flat of a chef's knife or a garlic press. Step 3When the cod and potatoes are done, drain them well, remove the bay leaves and place them in the work bowl of a mixer along with the garlic. Beat them to a rough puree on low speed, scraping down the sides of the bowl. This will only take a minute or so. Step 4Heat the oven to 400 degrees. Heat the olive oil over low heat in one pan. In another pan, gently warm the whipping cream. Step 5When the olive oil is hot and the cream is very warm, add them to the cod-potato mixture in a thin stream, continuing to beat on low speed. The mixture should form a slightly lumpy, slightly stringy puree. Add the lemon juice, taste and adjust the salt. There should be just enough lemon juice to balance the richness of the dish. 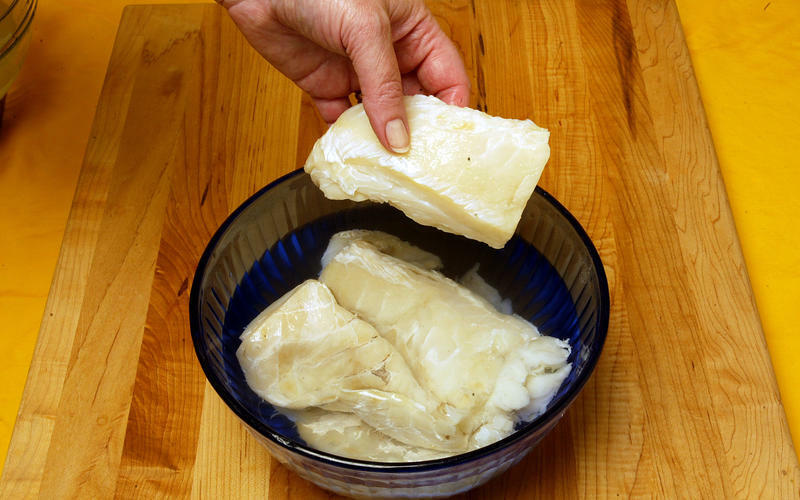 The amount of salt necessary will depend on how well the cod has been soaked; it may not need any. Step 6Butter 6 (6-ounce) ramekins. Spoon the mixture into the ramekins (The recipe can be made to this point and refrigerated, tightly covered, for up to 1 day.) Place the ramekins on a baking sheet and set in the oven. Bake until the tops are lightly browned and bubbling, about 30 minutes. Step 7Slice the baguette about one-fourth-inch thick on a long diagonal. Place the baguette slices on a baking sheet and bake until lightly browned, 15 to 20 minutes. If the ramekins get done before the baguette slices, remove them first and set aside. Step 8When ready to serve, drizzle the top of each ramekin with a touch of walnut oil and serve hot, with the toasts on the side. In Recipes-list.com we have selected the most viewed recipes from category - Appetizers Fish and shellfish Main courses . Enjoy the best recipes specially selected for you! Delfina's brandade is the right choice that will satisfy all your claims.